Months in advance I start my research. Check as many sources on and offline as you can. You will find differences and sometimes come away with more questions than answers; that's good. You want to document the truth. Even if you speak the language a translator comes in handy. The best documentation may be written in a foreign language and in many cases, just as in the spoken word, local dialects and ancient scripts may make your college language skills useless. On-site visits, months in advance, if possible, are a big bonus. Study the terrain, position of the sun, find the village office, determine the dates, times and locations where events will take place. Plan ahead, look for stores, water supplies and a place to sleep. Starting with the village office clerk or groundskeeper, smile, let them know what your intentions are and be respectful. Tell them you want to learn and document their culture, if it's permissible. Most places I've been people go out of their way to assist me. Usually, I'm introduced to VIPs like the Village Chief, Elders, Historian, Mayor or the author of a book on the topic I'm documenting. Don't limit yourself to just the City Office entourage, the farmer in the field, fisherman, an old couple sitting in a park, children playing and even, the town drunk, all have stories to tell about the festival. Introduce yourself, get people used to you being around with a camera. They will be more comfortable around you the day of the big event. You may be able to get some photos where participants pose for you in perfect lighting, without them being self conscious, as they would be around a total stranger. Shopkeepers, markets and vendors are all great sources of infomation and more likely than not, related in some way to the folks you met in #4 above. Have a meal or two, buy some local produce, get some snacks and drinks at the little Mom and Pop Stores. Ask about local lodging if you're not planning on pitching a tent. Learn the customs. It may be appropriate to bring gifts. You won't know until you ask. 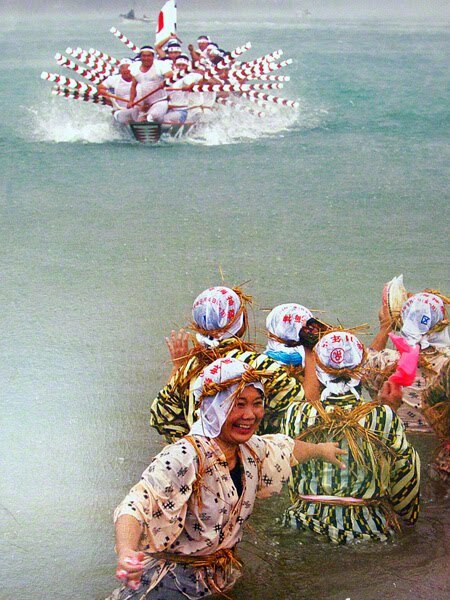 The photo above was taken in the Village Office at Shioya Bay, Ogimi in Okinawa, Japan. It is of a photo taken at a previous UNJAMI FESTIVAL. The Festival takes place August 29th this year. Wikipedia Dude says the festival takes place in July and the guys in the boat are priestesses. I've only made three visits to Ogimi and will attempt two more so when I'm done with my Photo Essay it will resemble a true story!